Located near the intersection of Fort Hill Street and Calhoun Drive in the center of the Clemson University campus. Current status  The land is now Clemson University. 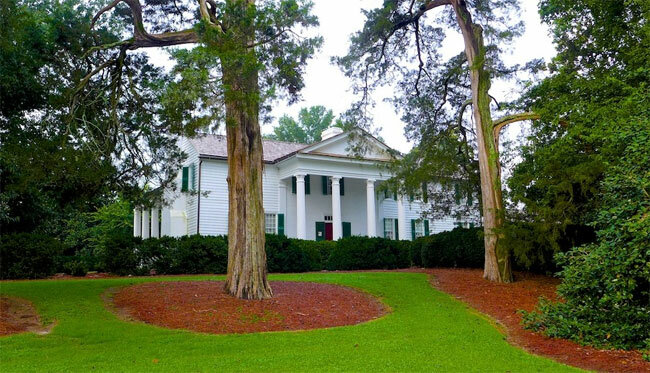 The plantation house is open to visitors. Robert Tate was granted 600 acres by the state (1, p. 2). 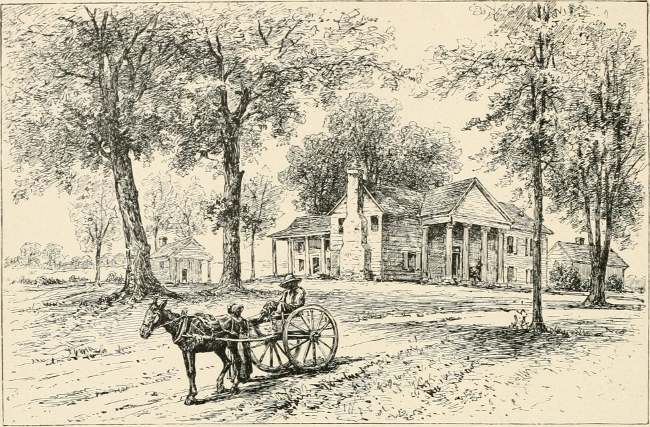 The land was referred to as the Fort Hill Tract because of Fort Rutledge that had been built in 1776. General Andrew Williamson of White Hall Plantation was in command of the forces in the area during the Revolutionary War. He applied to Governor John Rutledge for funds and authority to erect a defensive fort. His request was granted and the fort built was named Fort Rutledge in honor of the governor (9, bk. 2, vol. 18, p. 7). Late 1700s  John Ewing Calhoun owned the plantation (1, p. 2). 1802  The property was deeded to Reverend James and Elizabeth McElhenney. They built a small four-room house and called it Clergy Hall plantation (1, p. 2).
?  Reverend James McElhenney died. The property was purchased by Mrs. John Ewing Calhoun (1, p. 2). 1811  Mrs. John Ewing Calhoun's daughter, Floride, married John C. Calhoun. They were first cousins once removed. 1825  John C. Calhoun moved his family from Washington, D.C., where he was serving as Vice President of the United States, to Fort Hill Plantation. He rented the property from his mother-in-law, Mrs. John Ewing Calhoun (1, pp. 2, 6). He and Floride had 10 children, seven of which lived to adulthood. The Calhouns raised their many children on the plantation and remodeled the house several times to accommodate their large family. The house eventually contained 14 rooms (1, p. 3) (6). 1836  Mrs. John Ewing Calhoun died and her daughter Floride inherited the plantation. She and husband John C. Calhoun would both be on the title (1, p. 2) (2). John C. Calhoun began purchasing adjoining tracts of land until he had accumulated about 1,100 acres (1, p. 2). 1838  Anna Maria Calhoun, daughter of Floride and John C. Calhoun, married Thomas Green Clemson in the parlor at Fort Hill on November 13 (5). 1840  The Clemsons moved to Fort Hill and lived with the Calhouns for the first five years of their marriage. 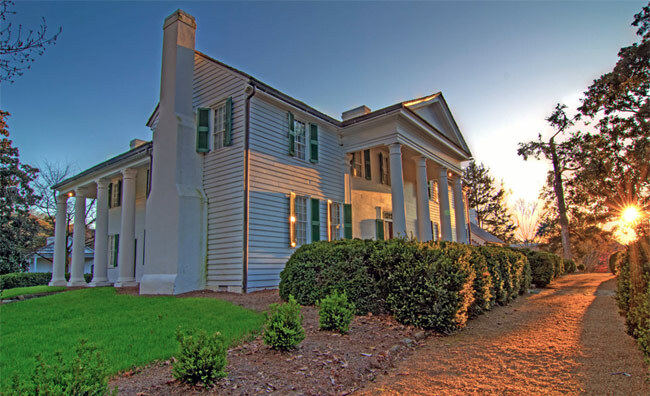 Clemson purchased Cane Brake Plantation in 1843 but was appointed as ambassador to Belgium and the family moved to Europe for Thomas Clemson's political career (5). 1850  John C. Calhoun died in Washington on March 31. He was buried in St. Philip's Episcopal Church in Charleston. Calhoun's widow, Floride, became sole owner of Fort Hill which consisted of 1,341 acres at the time (1, p. 2) (2). 1854  Floride Calhoun sold Fort Hill to her eldest son, Andrew, who continued to operate the plantation (6). 1865  Andrew Calhoun died and Floride Calhoun was once again the owner of Fort Hill (6). 1866  Floride Calhoun died and willed most of the Fort Hill property to her daughter and only remaining child, Anna Maria Calhoun Clemson who was married to Thomas Green Clemson. The Clemsons' daughter, Floride Elizabeth, also inherited some of the plantation's property from her grandmother, Floride Calhoun (2). 1872  Thomas and Anna Clemson retired to Fort Hill (7). 1875  Anna Clemson died of a heart attack and willed Fort Hill to her husband Thomas Green Clemson. It was her wish that her husband preserve her father's house and use the land for a state agricultural college (2) (7). 1888  Thomas G. Clemson died of pneumonia at the age of 81. His will states that he has "determined to devote the bulk of [his] property to the establishment of an agricultural college upon the Fort Hill place." After court proceedings, which culminated in Clemson's son-in-law taking the case to the US Supreme Court, his will was honored when passed by the state legislature and Clemson University, then called Clemson Agricultural College, was founded (1, p. 5) (7).